Product Safety-Advanced Solar Power (Hangzhou) Inc.
and use of solar cells, etc.. The study results show that the highest cadmium emission is oil which achieves 44.3g/GWh, the second highest is coal about 3.7g/GWh. 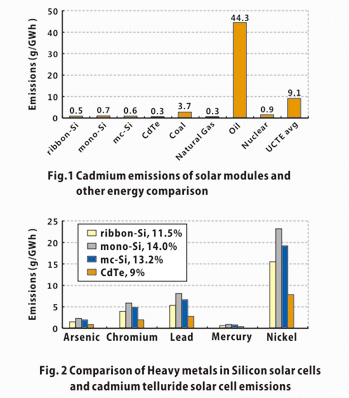 The cadmium emission of CdTe thin film solar module is only 0.3g/GWh as same as natural gas. In the summary, with the lowest cost of power generation, the ASP CdTe thin film solar module can help the world to achieve the revolution of clean energy and harvests of both economic and environmental benefits.